A site about living a Christian life Even If . . .
← OUT OF ORDER! – Why is “loving our neighbor” so important? Looking for Love in all the wrong places . . .
50 miles west of Socorro, New Mexico on US highway 60 sits one of the most fascinating examples of man’s desire to figure out his purpose and reason for being. It is called the Karl G Jansky Very Large Array or VLA for short. there have always been sacred place to go where we connect with the heavens . . .
“I think its because we are looking for the meaning . . .
“We are adding more and more to our understanding of the universe. You don’t have to be a scientist to be thrilled by that. “We’ve always had the night sky to look at – to ask questions about it – to wonder why it looks the way it does. “Why is it that the earth happens to be the place where humanity has grown up? What is special about that? And the ONLY way you can understand that is by looking at other stars, other solar systems . . .
“ For me astronomy HAS to be a part of any civilized society like music or art . . . Throughout the film, a common theme appears again and again . . .
“What made me? – What is the origin of my existence? Thus, we have the paradox of humanity – looking for the finite in the infinite. It is the age old question of creation. There are many theories – many postulates – many theorems – many hypothesis. You see, many times, science is used in the rationalization for why there is NOT a creator God of the universe instead of as a PROOF that there IS! 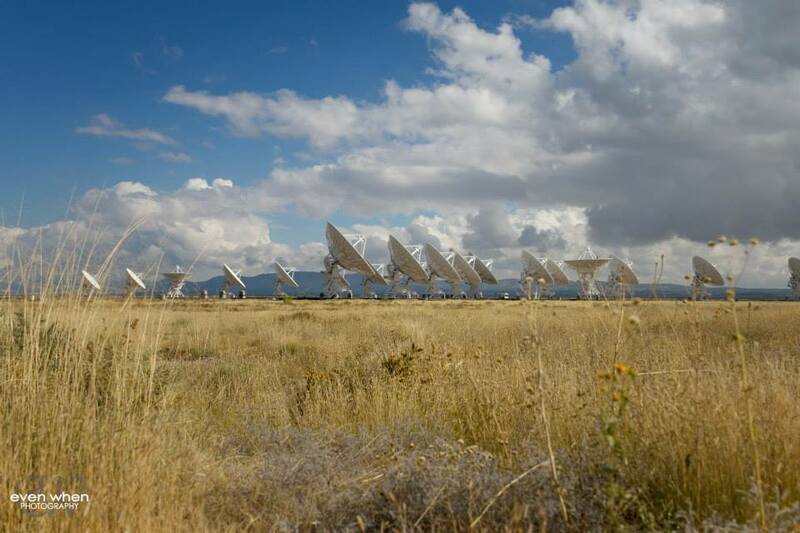 The VLA stands as a monument – an idol if you will – to the false god of human endeavor and human reasoning. People refuse to accept a God that created, but have no problem accepting that an explosion created. They ask, “Who created God?” because there has to be a finite . . . and yet, they have no problem accepting an infinite chain of events in the stars – – – think about that for a second . . .
How was the first matter constructed that allowed these chain of events? How did something come from nothing? Whether scientists have the integrity to admit it or not, they believe in the infinite even while searching for the finite. The very math they use, they use the symbol ∞ to express the concept of without any limit. The formula for π is just one example of an infinite series in mathematics.
. . . and the wise and the intelligent search for answers and understanding everywhere BUT . . . because they refuse to accept a creator God as the origin of the universe. In their intellectual pursuit and questions, they refuse to accept that a creator God can be the impetus behind the formation of the universe. And maybe, just maybe, it is their own pride in their intellectual superiority that prevents them from understanding or accepting that the creator God’s least intellectual endeavor is infinitely greater than their wisest of their wise. we are looking for the meaning . . .
our understanding of the universe. “Why is it that the earth happens to be the place where humanity has grown up? What is special about that? so that what is seen did not come into being out of existing phenomena. that is, our sins have been forgiven. 15 He is the visible image of the invisible God. and he holds everything together. 15 May you be blessed by Adonai, the maker of heaven and earth. “Adonai God of Isra’el, who dwells above the k’ruvim! You alone are God of all the kingdoms on earth. You made heaven and earth. 15 “Men! Why are you doing this? We’re just men, human like you! who made heaven and earth and the sea and everything in them! 2 He was with God in the beginning. and without him nothing made had being. and the life was the light of mankind. and the darkness has not suppressed it. You see, all of these people, and many more like them, are looking for the answers to creation. They will explore every option – – – as long as – – – that option does NOT start with a creator God. 4 “Where were you when I founded the earth? Tell me, if you know so much. or who stretched the measuring line across it? here your proud waves must stop’? The text gives us every answer the above scientists are searching for . . . The text tells who the Creator is . . . The text also tells us that the Creator God is Love . . . These scientists continue to look to the stars for their answers because they refuse the truth that has been given to them already . . . They refuse to trust – refuse to accept . . .
As a result, they are literally looking for the origins of creation in all of the wrong places . . . They are looking for LOVE in all the WRONG places . . . . This entry was posted in Thoughts and tagged creation, love, New Mexico, VLA. Bookmark the permalink. Arekaygos Arekone: 2nd Temple Warrior EXTREME! WWJ(not)D? Part 3 in a series . . .
Are YOU a Christian? Part 2 in a series . . .
GOD wants me to SUFFER?!? A Dog returns to its VOMIT . . .
Who is calling the plays in your life? How would you advertise Christianity to the masses on Super Bowl Sunday?